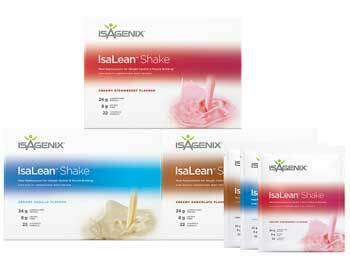 Isagenix IsaLean Shake - Buy Shakes Direct from UK! Isagenix IsaLean Shake £ £29.95In stock! Order now! Much more than an ordinary meal replacement shake, the Isagenix IsaLean Shake is the culmination of years of research and development by some of the top nutritionists in the world. This professionally formulated, all-natural shake is loaded with premium ingredients clinically proven to fuel your body, lose weight, and improve your overall health. With a perfectly balanced blend of essential nutrients and three delicious flavours to choose from, it’s a quick and tasty way to nourish your body and perform at your absolute best! 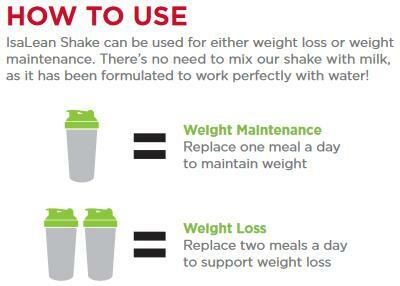 For more information download the Isagenix Shakes product information guide. What’s Special About the IsaLean Shake? First of all, Isagenix shakes actually taste good. Unlike most meal replacement shakes that taste like liquefied cardboard, the IsaLean Shake comes in three tasty flavours (French Vanilla, Dutch Chocolate, and Strawberry) designed to provide you with not only nourishment, but tasty goodness as well. Note: IsaLean Shakes now come in a dairy-free (plant based) option as well. More importantly, this unique meal replacement shake helps curb cravings and boost your metabolism, all the while replenishing your body with a proven blend of healthy fats, protein, carbohydrates, active enzymes, and ionic minerals. That being said, whey protein is the cornerstone of the IsaLean Shake. In fact, each shake contains 24 grams of top-quality whey protein from healthy and happy grass fed New Zealand cows. Aside from the quality of the whey protein, the extraction method used by Isagenix is also unique. Unlike most companies who use heat or acid during the extraction process for reduced costs, Isagenix’s whey protein is cold extracted in the safest and most effective manner possible. The result is a super high quality and nutritionally packed protein that’s better for the body and packs more punch. The IsaLean Shake provides 24 grams of premium protein, six grams of healthy fat, and just the right amount of low-glycemic carbs, and only 240 calories. This perfectly balanced formula allows you to maximise your body’s fat-burning abilities and safely minimise your caloric intake while enjoying a highly nutritious, low-cost meal. How Many Isagenix Shakes Do You Consume a Day? The new and improved IsaLean Shake contains an updated Myo-IsaLean Complex with 50 percent more all-natural, un-denatured whey protein than previous formulas, providing you with even better muscle maintenance and glycemic response. The whey protein found in the new and improved Myo-Isalean Complex contains more branched-chain amino acids than milk protein. These amino acids are absorbed faster and able to quickly go to work growing and maintaining muscles. Since they trigger a lower glycemic response as well, they’re also capable of reducing hunger. Myo-IsaLean Complex provides you with an increased whey/milk ratio, which has been proven to help you feel full for longer and greatly reduce cravings in between meals or shakes. Milk protein concentrate is used as the primary protein source in the MyoIsaLean Complex, increasing the branched-chain amino acid concentration. This higher concentration fuels lean muscle growth and boosts your body’s ability to efficiently burn fat. Isagenix IsaLean Shakes also help maintain healthy blood sugar levels. In addition to benefitting your organs, this also helps you reach and maintain your ideal body weight. Thanks to their increased lactase levels and eight grams of fibre, Isagenix Shakes are easy to digest and help maintain stomach health. Everyone is jumping on the gluten-free bandwagon these days, and for good reason. Now available in a gluten-free formula, you can now enjoy superior nutrition without suffering from food allergies and other adverse side effects associated with having gluten in your diet. Lose Weight and Get Healthy with Isagenix Shakes Today! IsaLean Shakes provide you with the very best nutrition to promote improved overall health while helping you achieve your weight loss and fitness goals. When used in conjunction with nutritional cleansing and Isagenix’s other safe and effective products, you’re all but guaranteed to look and feel better and each every day. Enjoy! Isagenix Shakes can be purchased for £40 per box at full retail prices, or sign up with us (UK’s #1 distributor) and pay just £29.95 per box. Each box comes with 14 individual sachets. 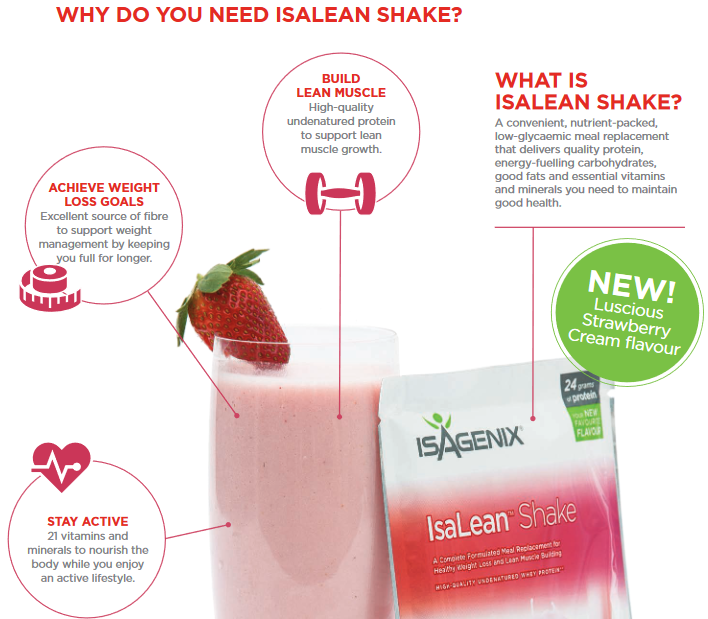 Read Isagenix IsaLean Shake reviews from real Isagenix UK customers! I'd previously had these shakes around 2 years ago, and decided to give them another try post baby. They made weight loss so much easier and I was able to return to my previous weight in no time at all! Great tasting product and meal replacement which leaves me feeling full. I typically use the shakes in the morning as a quick solution to helping me manage my weight lose goals. Awesome tasting and my favourite flavour is the chocolate, but strawberry is also good! Great way to manage my weight (much easier than any other product I've tried). Highly recommend these products.